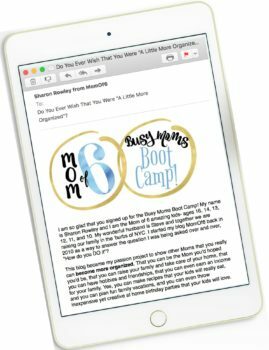 How to Get Organized When You Are a Busy Mom! Motherhood is one tough, all-encompassing, daily battle through the laundry, lunch boxes, carpools, and endless school papers kind of gig. When your to-do list is long, and your hours feel short- you need some routines and structure in your life to help you to manage your time! 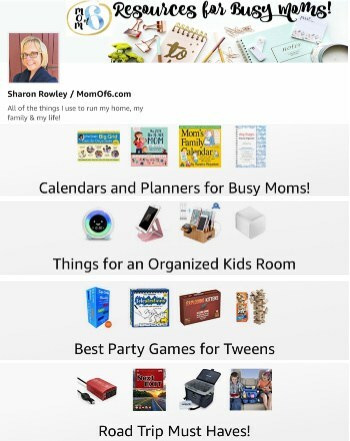 Here's exactly how to get organized when you are a busy Mom! So Why Do You Want to Organize Your Life Anyway? If there's one thing I've learned from parenting 6 kids- it's that when I feel in control of my schedule, when I know where I need to be and at what time, when my home is picked up and uncluttered and I can find whatever it is that I am looking for, and when I have a game plan of what I need to accomplish each day and can check a few things off of my list- I feel less stressed. I am more patient with my kids. I don't get that panicky feeling that tells me I am forgetting something (or someone) somewhere! Life just runs more smoothly. And I am a happier person. So why is it so darn hard to get organized? 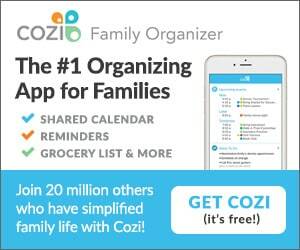 How many times have you vowed to get organized? Every back to school season? Every New Year's Day? Every Monday morning? Yet somehow- life gets in the way! 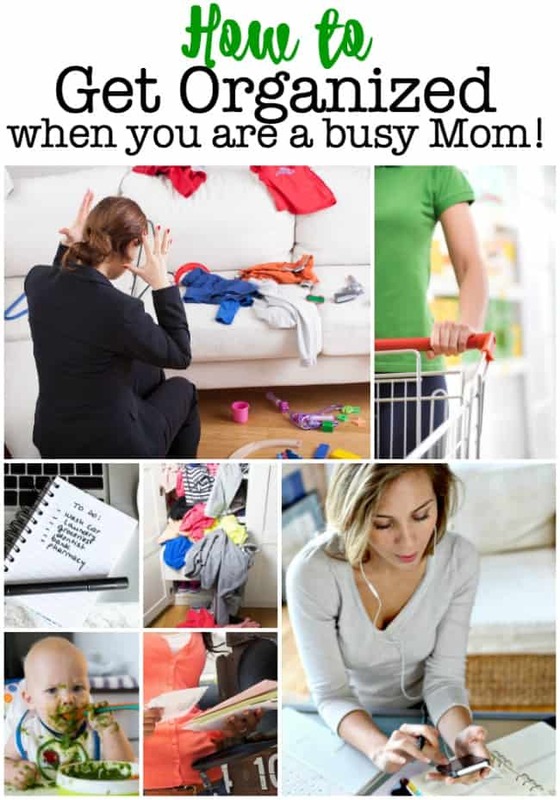 And we feel that we just don't have the time to get organized- because as a busy Mom- there is always something or someone that demands our immediate attention. We see Marie Kondo's method of decluttering your entire home at once by pulling everything we own out of our closets or cupboards- and think- THERE IS JUST NO WAY! And we wonder- where do we even begin? 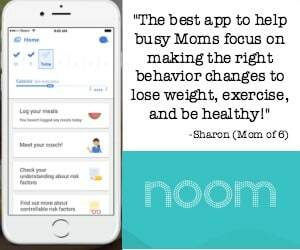 By becoming a “Mom with a plan”. Saying you want to “get organized” is kind of a broad commitment. And it's just not realistic to tackle a whole-life organizing makeover all at once! So where do you want to begin? There are likely some areas of your life that are working well, and some that could use a little polishing. Do you and your family use routines in the morning to make the process of getting out the door smooth? Do you rely on evening routines to get your family ready for the next day? Do you feel on top of your schedule- know where and when you have appointments and commitments? Aside from raising these small humans, do you struggle with understanding your life's purpose? And how to make any progress towards your own personal goals? Do you feel buried in paper- mail, bills, fliers, permission slips, invitations, sports schedules, magazines, and more? Think about your answers to the questions above and decide what area of your busy life you'd like to tackle first! If you are ready to get started- well then this is IT! 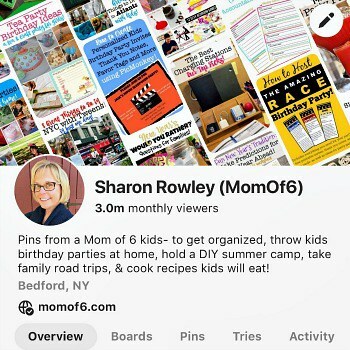 These posts will walk you through a total overhaul of your in-home systems and routines that can help you to quickly become more organized. But sometimes we fail to start- because we just don't know where to begin. This post has 6 steps to help you start to organize your life– and it is a great place to get you started! The fastest way to get control over your life is to get all of your appointments and commitments down onto a family calendar. Ideally- one that you can share with your significant other and even your kids (when they're ready). The idea behind having a functional command center is that you have one place where you put EVERYTHING you need- your important papers, your calendar, your to-do list, your grocery list, your incoming mail, and all of that paper that the kids bring home from school. It can serve as the family communication center and keeps everyone in sync! 15 Perfect Paper To Do Lists for Busy Moms! How to Get Things Done: 6 Tips to Help You Cross More Items Off Of Your To Do List! Family routines for yourself and for your kids that outline the steps of what you need to do and the order in which you need to do them to get through a particular part of the day make our lives SO much easier! Create a Habit of Putting Things Away Right Away! Menu planning is truly one of the best tools you can use in your quest to organize your life! When you know what you plan to serve for dinner each night of the coming week, you can make sure that you buy what you need during your weekly trip to the grocery store. A menu plan allows you to know if you need to take something out of the freezer ahead of time to defrost….. and the best part of all- is that the 5:00 pm hour seems a heck of a lot calmer because you are just executing a prepared plan… vs trying to think of one! You know the old saying “a place for everything and everything in its place”? Well, there's a reason why that expression is still around- because order in our home leads to order and a sense of peace in our lives. When we are surrounded by clutter and “too much stuff” it becomes much more challenging to find whatever it is we are looking for. We end up buying duplicates (or more!) of things we already have because we can't find it. It drains our wallets and drains our sanity too! But keeping a neat and clean home does not need to take up a ton of your time to get in shape and to maintain. It's about tackling projects in small “bite-sized” pieces to get your home the way you want it, and then creating habits that allow you to keep it that way! 20 Great Ideas to Get Your Kids Room Organized! Organizing Sunscreen & Sunglasses– So You Don't Forget Them! 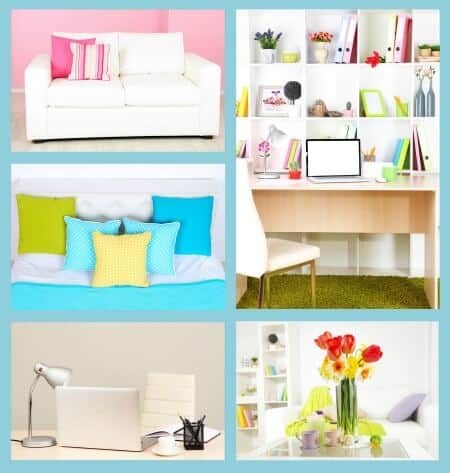 10 Home Office Organization Ideas! Moving a Teen Into College? Free Printable Dorm Room Checklist and 20+ Organized Dorm Room Ideas! Let's start by first reflecting on where you've been- what's been working for you, what were your accomplishments over the last year, and what made you feel happy? I've created this free printable gratitude list that you can use to write down your thoughts. Once you have really given some thought as to what made you feel happy and grateful, move on to this goal setting worksheet where you can get very specific with setting goals and making a plan for each of them (using the SMART method of goal setting). Once you've laid out your intentions, you'll need to have a way to check in with yourself on your daily goals and also a way to break down your longer-term goals into weekly actionable steps- and the tracking sheets I created will help you to do that. How Can You Be Organized When the Kids Are Young and Not in School? 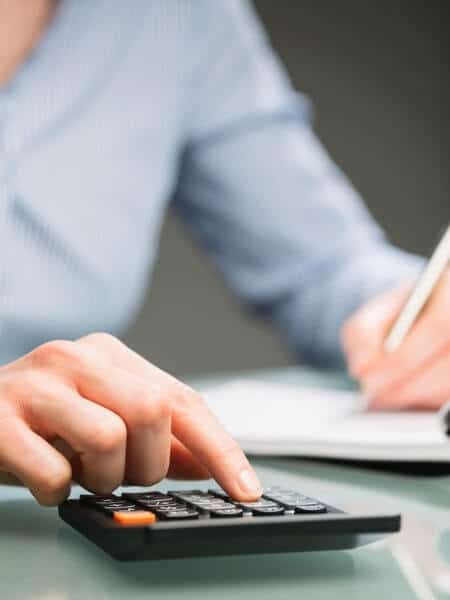 In addition to running the household many of us are responsible for managing the family’s finances- paying the bills, planning and sticking to the household budget, and even managing and tracking the family’s financial investments. But all of that paperwork, filing, and tracking can be overwhelming and can create its own mountain of paper clutter. Here's how to organize your finances, and track your money! 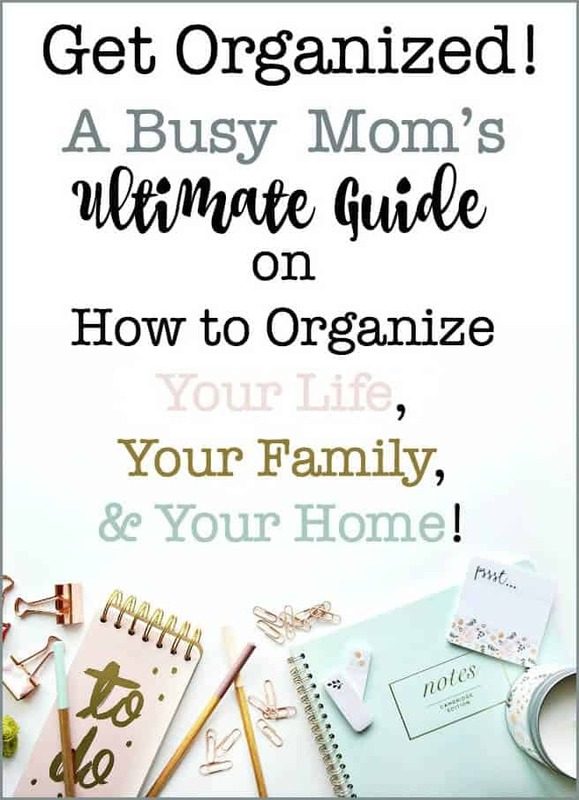 I hope that you found this to be a great resource for you as you work to become the more organized Mom that you want to be and leads you to happier and more fulfilled life!